Do you know someone that has always wanted to be a pilot? The perfect mix of flying, gentle exhilaration and friendly atmosphere at the gliding club makes for an unforgettable experience. Do you know someone that has always wanted to be a pilot? Send them on an introductory gliding flight with a qualified instructor over Melbourne. Gliding is one of Australia's fastest growing activities, and it's easy to see why. The perfect mix of elegant flying, gentle exhilaration and friendly atmosphere at the gliding club makes for an unforgettable experience. After an introduction with your qualified flight instructor you will be towed to your chosen release height by one of our tow aircraft (normally around 2-3,000ft). 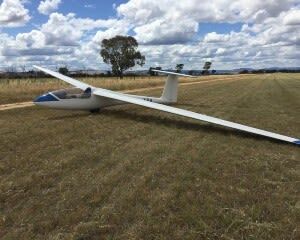 Once the required height has been reached the instructor will release the glider from the tow aircraft and the wonderful experience of "silent flight" commences. You will be soaring on the thermals in the same way as birds. In fact, with no engines to scare them away, don't be surprised if you are joined mid-flight by a local Sea Eagle! At his/her discretion, the instructor may also allow you to have some "hands on" flying experience and teach you the basics of flying the glider. This adventure flight is an excellent gift for any thrill seeker, with the option for time at the controls for someone who has always wanted to be a pilot. Introductory Gliding flight of up to 20 minutes (the length of glider flights depends entirely on the prevailing thermals - currents of warmer air that provide the lift). The booking process was a little awkward in getting a date & time. This may have been due to the company running the activity itself. Great experience coupled with a great team at the gliding club. The gliding club members were extremely welcoming and inclusive - terrific people all round. The flight was fantastic in every respect. Great Glider flight! Totally recommend to anyone looking for a great experience! As far as the staff is concerned they were friendly and helpful, but gliding is not my thing, but maybe for other people. The guys at the VMFG Gliding School were absolutely accommodating and friendly. I had an experience of a lifetime. Being very tall I was concerned about me fitting into the glider but they brought out a glider that tendered to my needs (but only just). To be up there gliding around seemingly effortlessly and in silence was an absolute buzz. Get out to Bacchus Marsh and do it! Well done and fully recommend the adventure as a bucket list experience.